To beach vacationers, the rhythmic the sound of the waves coming to shore provides peace and relaxation. To water skiers, waves are the peaks and troughs created by the boat pulling them along the aquatic surface … yet the surfer eagerly awaits the ultimate ride. To physicists, waves are disturbances transferring energy; then again, different types of waves exist. To sports fans, the wave is the standup-sit down ritual to create a rolling motion across a mass of people. Yet with hair, it refers to a curve or curl. As a verb, wave is associated with a variety of hand actions including a common gesture. Wave can indicate a sudden surge in emotions or numbers, but it can also be a persistent condition. This post is not about any of these or any definitions not included, but a place known as The Wave. Steve and I met as college freshmen on the windy plains of northwest Ohio. Through those college years, we shared a dorm room, had many of the same friends, and shared many memories. We were each other’s best man at weddings and though many states apart, we have stayed in contact and visited each other. Several years ago, I saw his photos of a land I had never seen or knew it existed. 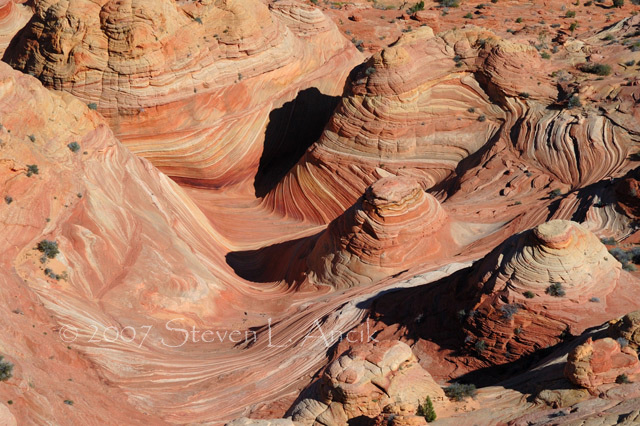 Figuring that many readers may not know this place, enjoy the Q&A and pictures about The Wave at Coyote Buttes in the Paria Canyon-Vermilion Cliffs Wilderness Area. If available, Steve will also try to answer comments and questions. You have visited your share of national parks. Why did this one take so long? The Wave was supposedly ‘discovered’ sometime in the 90’s, and I saw pictures of it sometime in the early 2000’s. Once I figured out where it was, I was determined to see it. As it turns out, by then many others had discovered it too; and there was in place a 20-person per day limit into the area. I managed to acquire two passes for July 4th (2007) coinciding with a mountain bike trip that a group of us had planned for the same week. One of my friends and I hiked there on a very hot (near 100 degrees) day. As a geologist, what impresses you about The Wave? 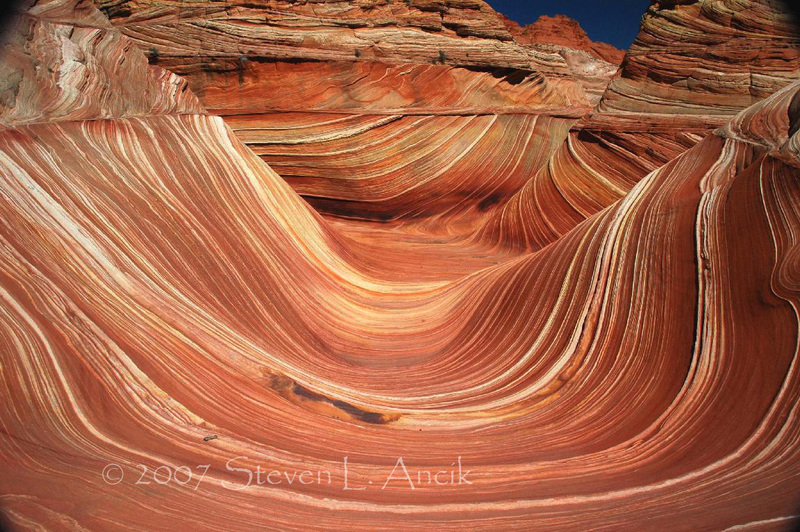 The Wave is formed from mainly wind-worn Navajo Sandstone, one of the most photogenic formations in the West. 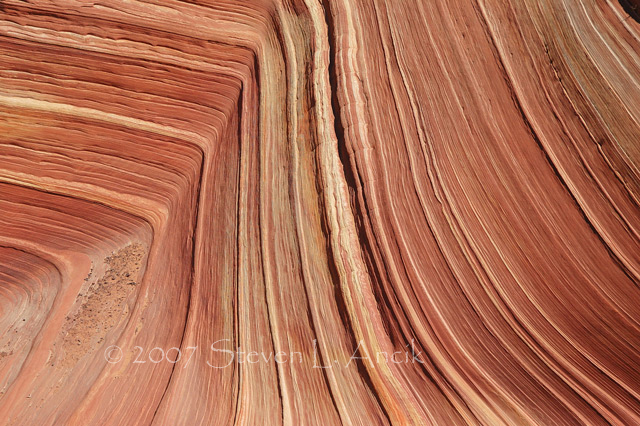 The layers of sandstone were originally laid down by wind in a huge sand dune field, and looking at the layers one can see the dune patterns. The really cool thing is that the formation was created by wind, and now the wind has created this beautiful formation. As a photographer, how does The Wave differ from other locations? It is a unique blend of colors, textures, and rock shapes. I have never seen another place like it, either in pictures or in person. 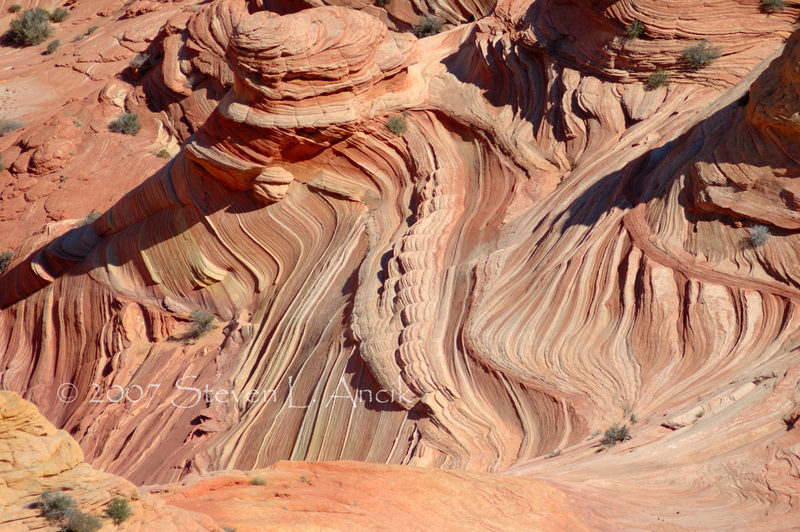 There are similar rock layers in some of the nearby areas, but none approach the perfect combination of features seen in The Wave. How difficult was the climbing within The Wave? 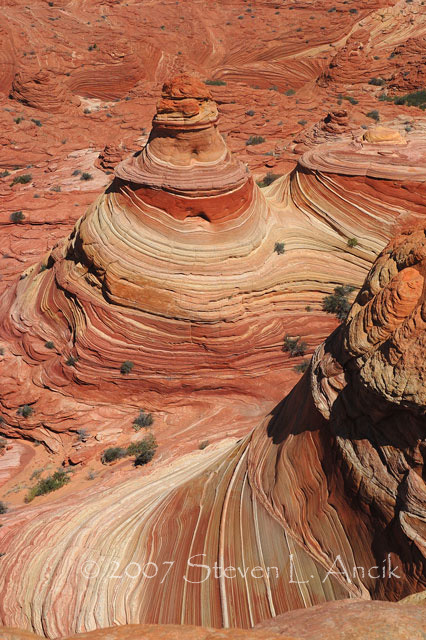 It is a 3-plus mile one-way hike across sand and sandstone to get to The Wave. Generally, it is not a difficult hike for somebody in pretty-good shape, but the temperatures in the summer are brutally hot, there is very little shade, and no water. Carrying a camera, extra lenses, and tripod limited the amount of water that I could carry, and on the day we were there, I ran out of water by the end of the day. Tell us anything else about The Wave that you have not already mentioned. Now, it is nearly impossible to get a pass into The Wave, as so many people want to go there, and there is a lottery set up to get passes. Most days have a hundred or more applicants. I have applied a couple of other times, unfortunately unsuccessfully.